1 in 3 U.S. families struggles with diaper need. 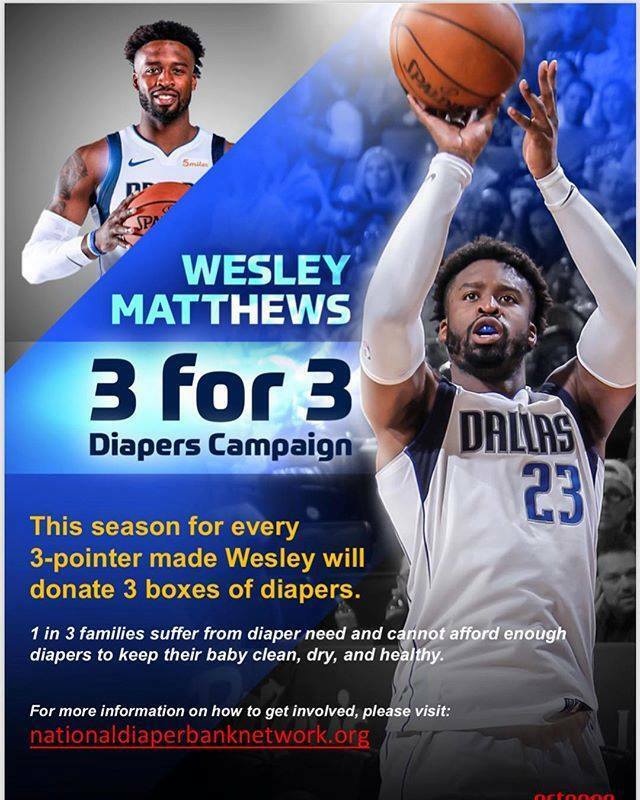 For every 3-pointer he makes this season, Mavericks' shooting guard Wesley Matthews will donate 3 boxes of diapers to the National Diaper Bank Network. Every 3-pointer made by Dallas Mavericks' Wesley Matthews this NBA season will spark a diaper donation to National Diaper Bank Network. DALLAS, TX, USA, November 28, 2018 /EINPresswire.com/ -- Dallas Mavericks shooting guard Wesley Matthews is adding his 3-point prowess to help raise awareness of diaper need and support for the one in three U.S. families who struggles to afford enough diapers to keep their baby clean, dry, and healthy. For every 3-pointer he makes during the 2018-19 NBA season, Matthews will donate three boxes of diapers to the National Diaper Bank Network, a nonprofit organization that helps families access the material basic needs babies require to thrive. Government programs designed to help children do not provide funding for diapers, a basic necessity for all babies. There are currently 5.2 million infants and toddlers living in poor and low-wage families in the U.S.
"Every parent wants what’s best for their kids and every baby deserves clean diapers. So, the issue of diaper need is near to my heart and my family, and I want to use my platform to help raise awareness," said Matthews. "Our children are the future and we need to make sure we do everything we can to set them up for success. One in three families can’t afford this simple, but required need for children and babies. Hopefully we can get that number to none in three. Every child deserves to be clean, dry, and healthy. I am excited to launch this campaign with the NDBN and get people involved." Raised by a single mother and with support from his grandmother and aunt, Matthew’s hopes his “3 for 3” campaign inspires others to get involved and donate diapers and dollars to the National Diaper Bank Network and its more than 200-member diaper bank programs that provide millions of free diapers to poor and low-wage families in communities throughout the country. Often a hidden consequence of poverty, diaper need impacts the physical, mental, and economic well-being of children and families. Of families in diaper need, three-in-five parents (57%) miss work or school due to a lack of sufficient diapers required by childcare, day care or early education programs to care for a baby or toddler. As a result, parents experiencing diaper need missed an average of four days of work or school in the past month (source: Diaper Need and Its Impact on U.S. Families, 2017). Seventy-three percent (73%) of all families feel they’re not being good parents when their children are left too long in dirty diapers, while one-in-three households in need experience feeling stressed or overwhelmed by diapering always or often (source: Diaper Need and Its Impact on U.S. Families, 2017). According to the Center for Economic and Policy Research, the poorest 20 percent of Americans who buy diapers spend nearly 14 percent of their post-tax income on diapers. About the National Diaper Bank Network: The National Diaper Bank Network (NDBN) is a nationwide nonprofit dedicated to eliminating diaper need in America, by leading a national movement to help meet the basic needs of all babies and their families…including access to clean, dry diapers and other material goods. Founded in 2011 with the support of Huggies®, the network raises national awareness of diaper need (#DiaperNeed) and supports the development and expansion of diaper banks in communities throughout the country. Its active membership includes more than 200 diaper banks, diaper pantries, and food banks located in 47 U.S. states and the District of Columbia. More information on NDBN and diaper need is available at www.nationaldiaperbanknetwork.org, and on Twitter (@DiaperNetwork) and Facebook (facebook.com/NationalDiaperBankNetwork).